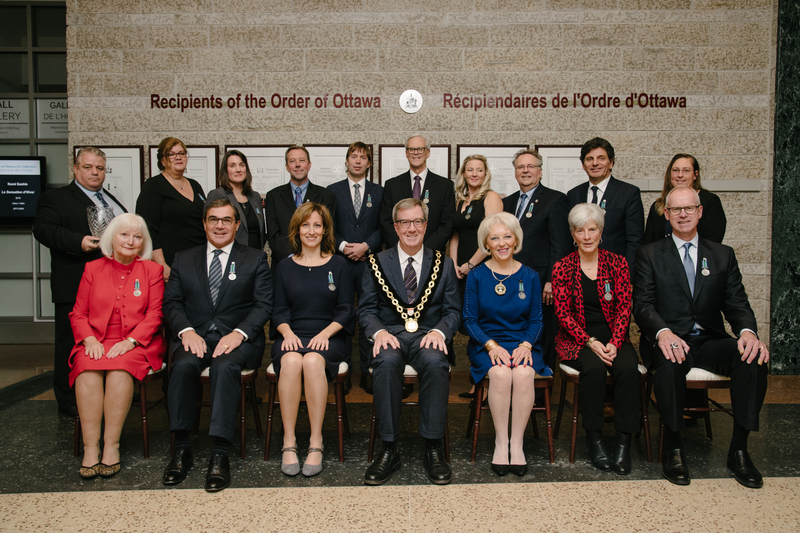 Ottawa – Mayor Jim Watson inducted 16 of Ottawa’s most outstanding residents into the Order of Ottawa during a ceremony this evening at Ottawa City Hall. Those inducted by Mayor Watson into the Order of Ottawa are: Julian Armour, Bernie Ashe, Graham Bird, Dr. Angela Cameron, Monique Doolittle-Romas, Marie-Claude Doucet, Barbara Farber, Emily Glossop, Elizabeth Graham, Lawrence Greenspon, David Rattray, Dr. Marc Ruel, Brian Tardif, the late Robert J. Wilson and Kathy Wright. Inderpreet Singh, one of the recipients selected to receive the award, was unavailable to attend this evening. He will be honoured next year during the 2019 Order of Ottawa ceremony. The Brian Kilrea Award for Excellence in Coaching was presented this evening to Aldège Bellefeuille, who was recognized for his dedication to youth and youth football in Ottawa. For more than a decade, Mr. Bellefeuille has been a coach and executive with the Orléans Bengals Football Club. A list of this year’s Order of Ottawa inductees will be prominently displayed on a wall on the first floor of City Hall, alongside the recipients from previous years. This civic award recognizes exceptional citizen contributions in the many areas of city life, including arts and culture, business, community service, education, public service, labour, communications and media, science, medicine, sports and entertainment, and other fields that benefit the residents of Ottawa. Recipients of the Order of Ottawa were chosen by a selection committee comprised of the Mayor, City Clerk and Solicitor, Chief of Police, Chief of Protocol, City Archivist and the Chief Executive Officer of the Ottawa Public Library. For more information regarding the Order of Ottawa visit the Order of Ottawa page on ottawa.ca. For more information on this year’s recipients, read their biographies.